Bookride: Guy Berkeley Breathed. Academia Waltz. Berke Breathed. (Guy Berkeley Breathed.) ACADEMIA WALTZ. Sterling Swift, Boston 1979. Cartoons. Pulitzer (pronounced Pull- it- sir) prize winning cartoonist (1987) syndicated in 1200 US papers. 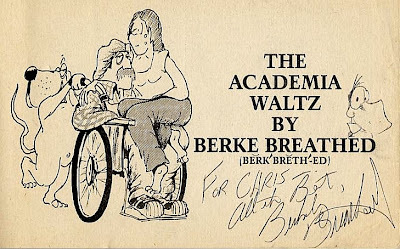 His first regularly published strip was The Academia Waltz, which appeared in the Daily Texan in 1978. The strip attracted the notice of the editors of the Washington Post, who recruited him to do a nationally syndicated strip. On December 8, 1980, Bloom County made its debut and featured some of the characters from Academia Waltz, including former frat-boy Steve Dallas and the paraplegic Vietnam war veteran Cutter John (see inscribed copy below.) Big animals rights man, zany name, rhymes with 'method.' He illustrated the cover of PETA's* "Compassionate Cookbook," their T-shirts, and other merchandise. This is his first book and was published while he was at University of Texas. 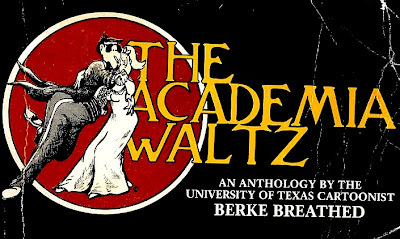 The Bantam Hall 1980 follow up 'Academia Waltz Bowing Out' is equally valuable and harder to find. WOW! I guess being at UT in 1980 paid off - I've got one copy of both of his books! Heading back to Austin this fall, guess a few used book stores will be on the agenda.